A short hippy freak-out collage video we made for the 1st Annual Seattle Bike-In Film Festival like, a million years ago. Are you coming to the movies in the park this year? Remember this video, broken by Seattle Bike Blog? And the strange controversy that surrounded it? The thing that I forgot is just how amazing this bike rider's reflexes must have been! What a toughie! Also, South Lake Union is more of a mess than ever. What a dangerous drag. 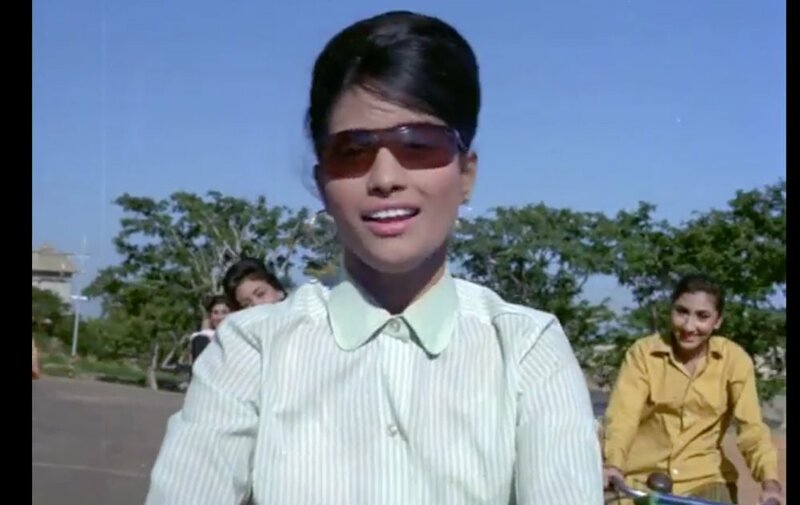 Main Chali, a Bollywood movie that I know nothing about, includes this lovely bike-borne musical number. I probably got this from a local bike blog. Anybody remember, so I can be classy and credit them? What a sad breakup! It is sweet and pathetic how the narrator layers his expectations of acclaim for his long ride in with his expectations of returned affections. Its like he is using the long ride to up the ante and force his gf to break it off with him. Umm, anybody else been there? Somehow, this reminds me of the tension that myself and many biking advocates I know express, where we want biking to seem easy and comfortable and safe, but at the same time need to keep the public aware that we need to do better and that the public needs to invest in making difficult, uncomfortable, dangerous biking easier, safer and more comfortable. Vexing. Early on in my mixed-transpo-mode relationship (as a biker dating a driver) I experienced a similar problem. I wanted my new sweety to see biking as easy, so that she would do it more. At the same time, I sometimes yearned for a cheering squad when I pulled off some kinda epic commute in torrential rains, or towed a ton of bike frames across town, or whatever. I wanted it all to seem easy and accessible and impressive and awesome at the same time. Well, since I opened up here I'll take a stab at giving myself my own advice. First of all: you can't trick people into biking. You can help those in your life choose to ride (only if they are interested) by helping them overcome the barriers that they encounter, not by selling biking in a PR campaign. Ya know, don't be a paternalistic know-it-all. Secondly: Biking actually is easy and awesome at the same time. No contradiction there. Usually, biking around is just normal people getting around normally. No biggie. But thank God that sometimes things get epic. A healthy awe for cargo bikers, pedal parents and daily uphill bike commuters is appropriate. Give 'em a high-five, its good for the movement!